The month of December is full of so much good tidings, I love it all. The decorations, the music, the wrapping of gifts and the best part that makes great memories is the time shared cooking and eating with the ones you love. We have many Christmas Day traditions that are set in stone, for me I have to do a few things for it to feel official. Over the last few years that my son has been more involved in the holidays and giving his voice to new traditions. He loves rice, egg noodles, chicken, egg rolls and all the delicious Asian foods he can find. When I asked him what he wanted for Christmas Eve dinner he said Panda please, that means he wants Asian food. One year we made the mistake of buying take out for our Christmas Eve dinner but never again. It was not the same flavor or experience if we would have cooked the food at home together. 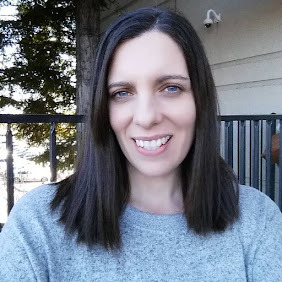 This year I headed to Walmart to pick up the items we need for our Asian inspired Holiday dinner party. My son loves to be my helper so he came along with me to help plan the party. 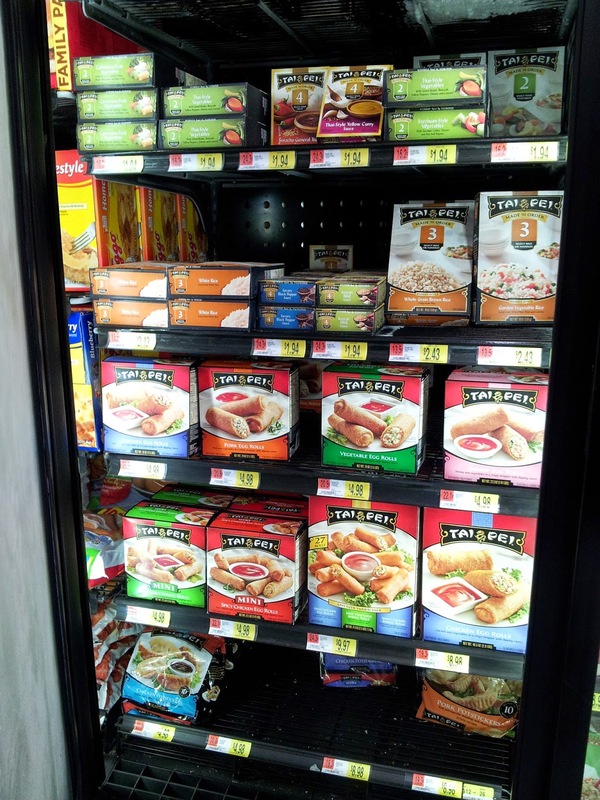 We found one of our favorite brands of frozen Asian foods Tai Pei. 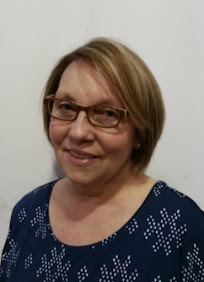 I planned to make a simple but delicious meal that would be easy to eat while watching holiday movies and easy for me to make. After getting all the items we need along with our Tai Pei Egg Rolls and Spring Rolls we headed home to cook. 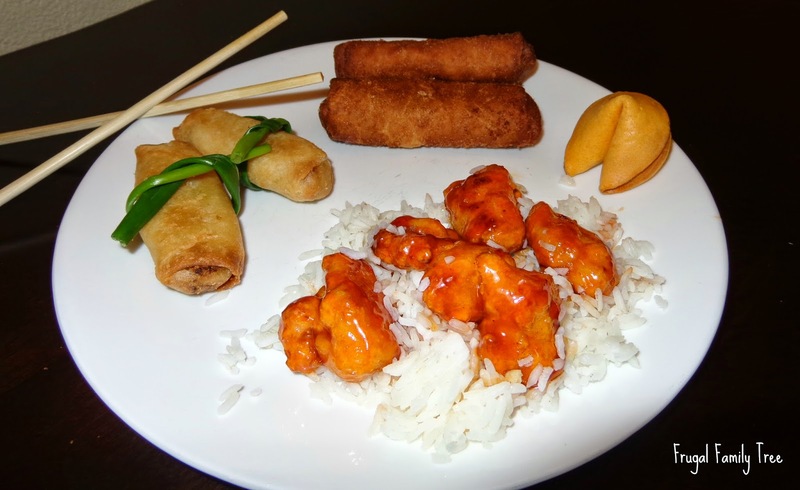 I am planning to make Orange Chicken with jasmine rice, Spring Roll mini presents and a Egg Roll Christmas Tree. To assemble the Egg Roll Christmas tree I used bamboo skewers and toothpicks to hold it together. 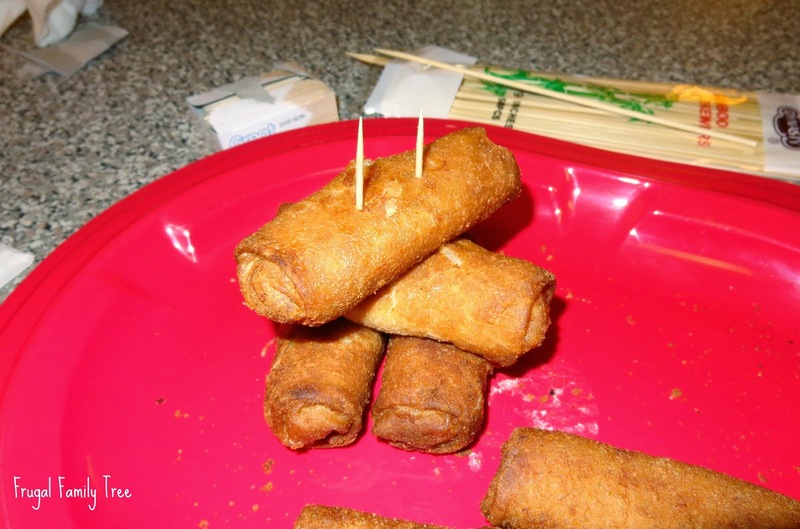 Depending on the size of the Egg Rolls you can stack the tree to however you want it to look. I mixed the Vegetable egg rolls and Spicy Chicken Mini egg rolls I had in my tree to give it variety of flavor as the tree is eaten. For the Spring Rolls presents I baked the mini vegetable spring rolls and tied green onion to the outside for a bow. For the egg roll Christmas tree I used the already made and included sauces that came with the food in the packaging for the decoration on the tree, the red sauce looked great and tasted delicious on the crispy wrappers. When dinner was ready the whole house smelled amazing! The scent of the orange glaze on the chicken, the jasmine rice, the egg rolls and spring rolls hints that its Christmas Eve. As soon as the food was ready and assembled my son was the first to sit down to try it all. His favorite was the mini veggie spring rolls. He is getting the hang of chop sticks but sometimes just uses them to poke food to eat, too cute! 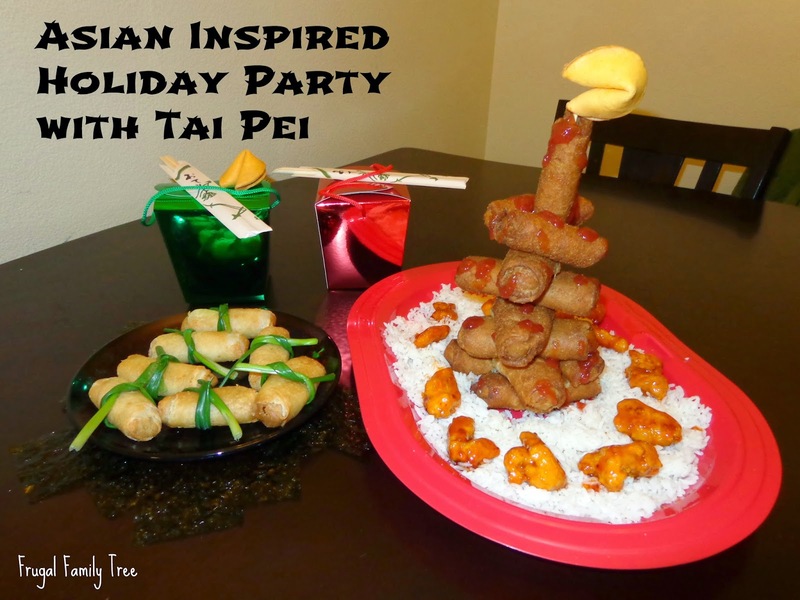 My son and I had a wonderful time baking the dinner and making our holiday themed Tai Pei brand treats. He loved that we were making our regular food into fun to eat food. I loved how simple it was to all prepare. Having frozen foods that you can razzle dazzle into something creative is the key to not over complicating the holidays. 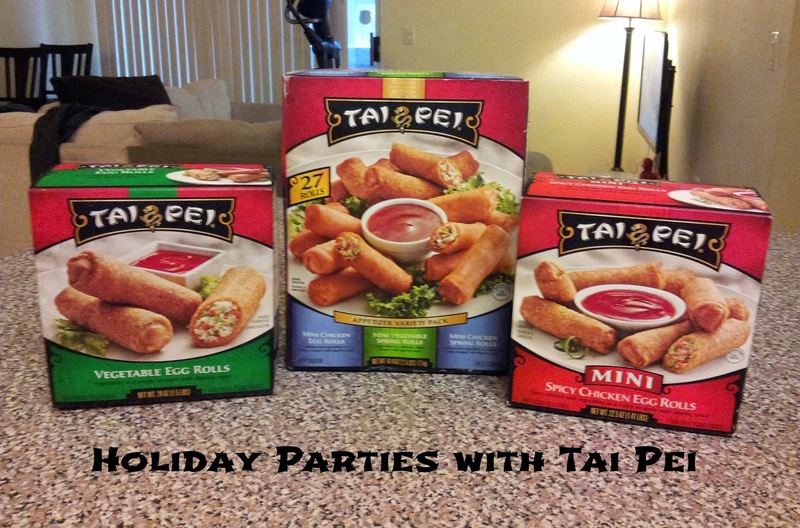 Tai Pei brand Asian foods makes it easy to have your own Asian inspired holiday party with traditional flavors for your family and friends. 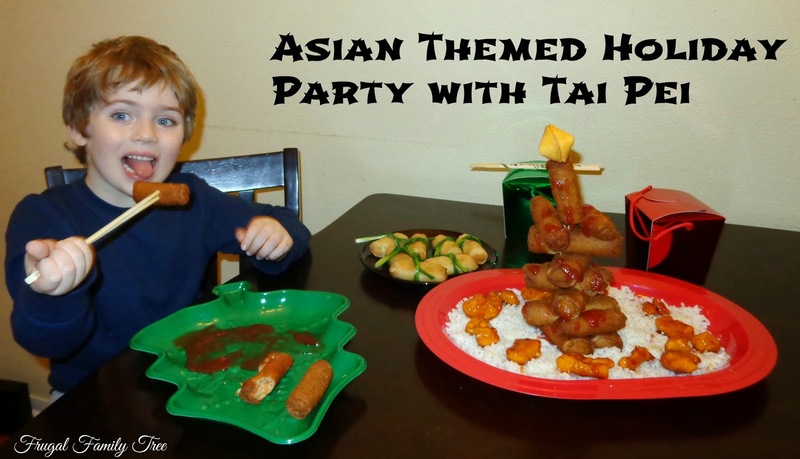 To find more recipe ideas for your next party you can connect with Tai Pei on facebook, twitter and pinterest. Tai Pei is also running a Rebate Offer that runs till 12/31 to save you more money on your purchases.